Staying healthy on the road is a challenge for anyone. Between the stressful change in routine, long hours, lost sleep, and exposure to germs, it’s a formula for getting sick. But travelling as a woman poses its own particular health risks. Here are some ways tominimize health risks during travel. This is a health habit that applies to everyone, not just women, but it is a basic hygiene practice that can go a long way toward keeping you well. Wash before and after every meal, every time you use the restroom, and any other time you have an opportunity. Give your hands and nails a good and thorough 20-second scrubbing, with lots of soap and water as hot as you can stand it. If you are travelling in wealthy, industrialized Western countries, chances are you will have plenty of access to clean water and bathrooms. But if you are going off the beaten path, good feminine hygiene practices are especially important. You may not always have clean water, a clean bathroom, a clean room —or access to a doctor who speaks English. Do your research so that you can know what to expect and be prepared to meet any unsanitary circumstances. This is especially important in tropical destinations where bacteria can multiply easily and infections are more common, with access to proper medicines more difficult. Being sensible and practicing some basic health habits will help you to stay fit as a fiddle. Keep your nails short and clean and, again, wash your hands before eating, so that you don’t swallow anything infectious. Don’t share towels. Wear protective footwear when showering. Drink lots of water to keep your urinary tract healthy—don’t avoid drinking because you fear you won’t find a bathroom. Hydration is critical to avoiding illness. Wear light clothing, in layers, to allow you to stay both warm and cool as necessary. You can’t always count on having the right supplies to promote good health, even in the most luxurious of travel conditions. Have a kit that includes a small bottle of sanitizer to disinfect, as well as cotton pads, toilet tissue and a travel size bottle of Aquinelle Toilet Tissue Mist to help you get thoroughly clean. Bring your own soap. Always have a bottle of water with you, and keep it filled with clean water as often as needed. Remember to carry cranberry capsules to avoid urinary tract infections. One of the most important parts of staying healthy is to have clean bathroom habits, and that includes getting really clean down there. Make sure you carry your own toilet paper if there is a chance you will be in a place that may not be stocked. And always carry your travel size Aquinelle Toilet Tissue Mist. Water is one of the most important ways to be sanitary in wiping, and by spraying your toilet tissue with a bit of dermatologically tested Aquinelle, you can be sure that you get thoroughly clean. For women, yeast and urinary infections can be very uncomfortable. Wear cotton underwear—you can find quick-drying brands. Eat yogurt as often as you can, or carry probiotics, so that you can get some good bacteria in your system and keep your intestinal and urinary tract healthy. Carry a good supply of feminine hygiene products. Use Aquinelle travel size mist to dampen your toilet paper and get properly clean, during menstruation, urination, and elimination. 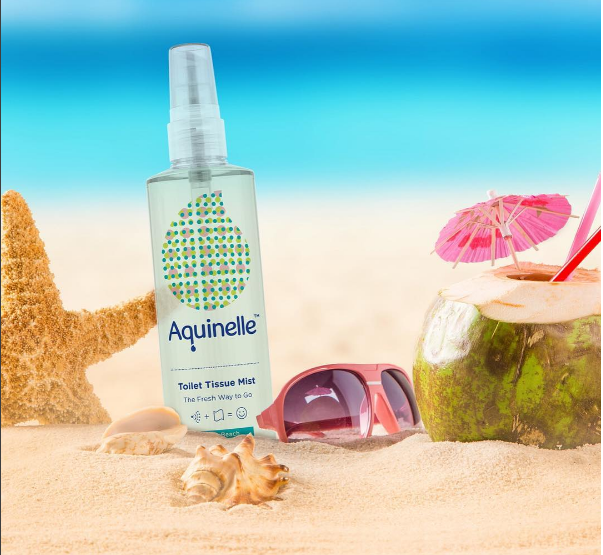 Make Aquinelle Toilet Tissue Mist an essential item for healthy travel. For more information and to purchase Aquinelle Toilet Tissue Mist, visit the Aquinelle website. And happy and healthy trails to you!